With Andrew's line of study politics frequently come up for conversation at the dinner table. Tonight the kids were asking about Hilary Clinton, which led to a discussion of carpetbagging, since Clinton ran for (and won) one of New Yorks seats in the senate, shortly after moving to New York. She was frequently accused of being a carpetbagger during her campaign. "So it's basically when someone moves to a state or city specifically to campaign for a political office there but without ever really living there so they might not really know the needs of the area they're supposed to be representing. I don't know why they call it carpetbagging..." Andrew trailed off. "Really?" I asked. "You can just hear the word 'carpetbagging' and figure out the etymology? It's not like it's terribly obscure." "Yeah, Dad," Rachel said. "Like Mary Poppins!" "Dad! Her magical carpetbag! A carpetbag is like a suitcase!" "Oh!" exclaimed Andrew as he saw this (very logical) connection between Mary Poppins and political jargon. Speaking of obscure etymologies though, let's talk about gerrymandering. I've known the basic meaning of this word for a considerable amount of time—redrawing boundaries all helter-skelter for political gain. I've known for a shorter amount of time that the word was gerrymandering and not jerrymeandering. That little realization completely broke the etymology I'd come up with in my mind, which was this: I knew something could be jerry-rigged (definition: fashioned in a careless or haphazard way) and I knew something could meander (definition: to follow a winding course), so, of course, something could be jerry-meandered (definition: manipulate the boundaries of an electoral constituency so as to favour one party or class). My etymology fit perfectly with the definition of gerrymandering but, alas, was so, so far off base. The real etymology has to do with a certain politician, Governor Elbridge Gerry, who, in 1812, "signed a bill that redistricted Massachusetts to benefit his Democratic-Republican Party. * When mapped, one of the contorted districts in the Boston area was said to resemble the shape of a salamander." Behold the spine-chilling salamander of yesteryear! 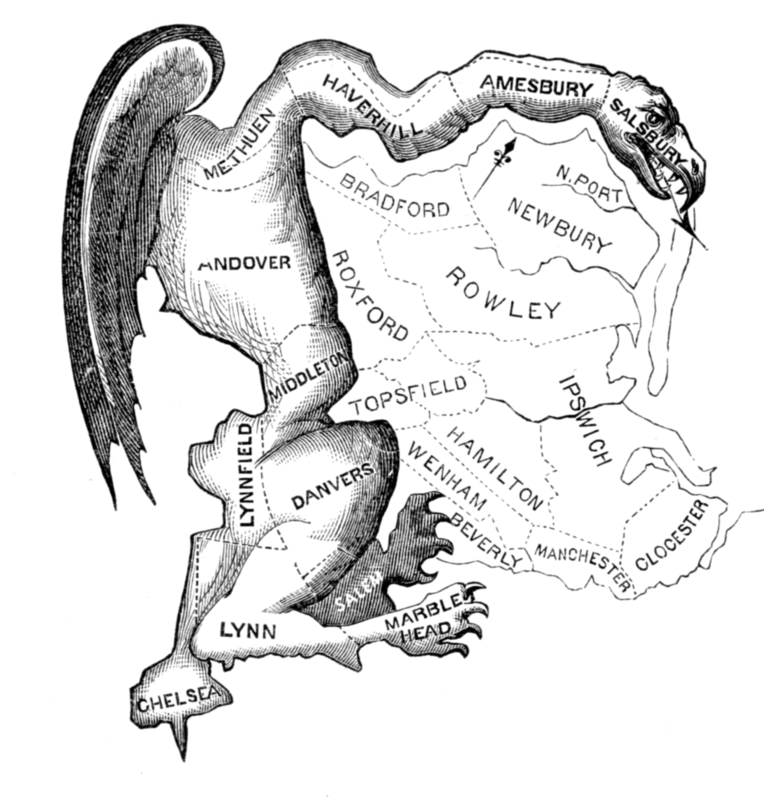 As it turns out, people thought that the new boundaries took the form of a (winged and rather ferocious-looking) salamander and since Gerry was the one who made the new boundaries a reality they lovingly called this terrible creation a "gerrymander," a portmanteau of Gerry and salamander. Honestly, that is a pretty spectacular etymology. With all the fervour of the upcoming election (thanks a lot, Burr (sir! ), for starting the whole "openly campaigning" business (I hate election season so much and it seems to last forever)) and watching the recent Canadian election of Premier Trudeau and following the news of the Fort McMurry wildfire rekindled (no pun intended) a desire to have my children learn more about Canada. I've been neglecting that part of their education so, to cure a bit of a homesick torpor, I ordered some books for us to read together and I'm quite excited for them to get here. I don't mind them learning about the United States. Quite naturally, that is what their social studies units focus on. My kids know the pledge of allegiance and the national anthem (Rachel will actually be singing the national anthem at an upcoming baseball game (in a choir...not by herself)) and the star-spangled banner evokes feelings of patriotism for them. All that is completely expected and as it should be because we're Americans living in America. But we're also Canadian and schools down here just don't cover Canada in as much depth as they do up there (for obvious reasons) so the task falls to me. Watching The Murdoch Mysteries has me almost crossing my fingers that a position at the University of Toronto will open up and we'll magically get it and move up north. But I swear that show pretends winter doesn't exist. They've had approximately one winter episode and it wasn't filmed in winter. The snow looked like cotton batting and I swear I could see people sweating. But I know Toronto experiences winter. Speculating about the future, however, has never panned out for me. We've yet to ever end up quite where we thought we were headed, but we've always ended up right where we need to be. * Can anyone else not say this to anything other than the tune of Hamilton? ** "Nancy Newt needs naps." Perish the thought! Andrew informed me that HE has known about Gerry the governor since grade eight. Apparently that picture is featured in text books. I had no idea. That's what you get when you're educated in a different country.